I'm a fanatic about bicycles, period. Road bikes especially, though I find all bikes to be fascinating and beautiful machines. The only bicycles I don't like are those that sit unused in a garage somewhere. Technically, this is my third road bike. And it's definitely a keeper. Red bikes have been scientifically proven to go faster, or so I'm told. And this one is truly unique. And there's a story about its acquisition. Having acquired a LeMond Zurich, my second road bike, I was spoiled. My Raleigh Grand Prix, the first road bike, became less "precious" if you know what I mean, and I actually started riding it more, using it as my "fast" commuting bike among other things. But then the frame broke, on the right chainstay near the dropout (see below.) After considering my options (repair the Grand Prix? buy a new bike? buy a frame? 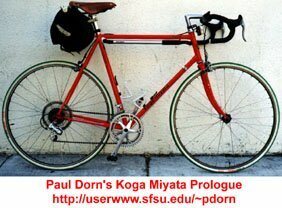 ), I finally bought a Koga Miyata Prologue frame at San Francisco's American Cyclery. I switched the parts over, creating a beautiful light road bike, and surely one-of-a-kind. Koga Miyata is a highly respected Dutch bicycle company. This frame was part of a surplus warehouse stock that American Cyclery acquired. It's a strong, well-made frame. Unlike the TIG-welded LeMond Zurich, the Koga Miyata has lugs! 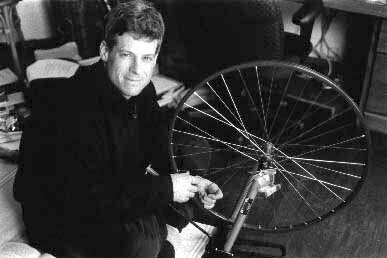 Being something of a fan of Grant Peterson, former product manager for Bridgestone and currently owner of Rivendell Bicycles, I agree that there is something special about a lug-steel bicycle frame. I've ridden this bike a lot since moving to Davis, and I participate frequently in the Tuesday and Thursday race rides sponsored by the Davis Bike Club. The rides happen from April to October, traveling in pace lines to Winters, a town about 16 miles west of Davis. After cruising through Winters, the ride picks up speed on Putah Creek Road, often roaring along at 30 mph or more. It's been fun, I've learned about drafting and riding in crowds, and it's helped to keep me in (reasonable) shape. After years of riding a rigid MTB, I decided in March 2000 that perhaps it was time to get a mountain bike with front suspension. I was turning 40 later in the year and while I can imagine myself riding on pavement well into my 60s or 70s (assuming I live that long), I probably only have another 10-15 years to enjoy the more rigorous and demanding activity of mountain biking. So I might as well enjoy it. After a great deal of comparison shopping, web browsing, magazine review consultations and a few test rides, I bought this Stumpjumper at American Cyclery in San Francisco. It's an excellent light frame, with great components. I've taken the Stumpjumper out for a few rides around the City, and for a few trips to the Marin Headlands in the Golden Gate National Recreation Area. It's a great riding bike, to be sure. Perhaps too great. I had my first spill ever on a mountain bike in April. After climbing up the Marincello Trail, I was descending the Bobcat Trail into the Gerbode Valley. Just past Hawk Camp there's a short descent followed by a short steep climb before the long downhill to the bottom of the valley. I was trying to maintain my speed on the descent to minimize the climbing on the other side. 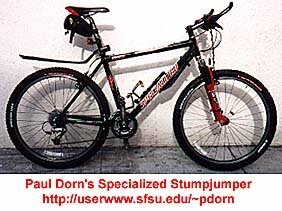 The Stumpjumper, with its front suspension fork, definitely goes faster than my old Hardrock. I was flying by the time I reached the soft sandy gravel near the trough of the dip. I think I panicked a little, hit the brakes and ended up taking a tumble. My shoulder and elbow were scraped up and bruised, and I was sore for a while, but fortunately the bike wasn't damaged. I was also lucky there weren't any other people around; the biggest injury was to my pride. I mean, I've done this descent dozens of times without a problem. This is my bike for long distance touring, not that, with work and all, I get much time to do any. My wife Marianne and I have only limited touring experience. Most recently, in October 1999, we spent a week cycling along the Oregon Coast. We took the AMTRAK Coast Starlight to Portland, spent a couple days there, then travelled by bus to Astoria. We began riding down the coast, stopping at inns in Cannon Beach, Tillamook, Lincoln City, Yachats and Florence. From Florence we travelled over to Eugene to catch the return train to San Francisco. If only we'd had more time. Sigh. Tech specs: Shimano RSX derailleurs and crankset, Tange double-butted chrom-moly tubeset, Ultegra bar-end shifters, Continental Top Touring 700 x 32 tires, etc. Following our Oregon bike tour, when I broke three spokes on the rear wheel, I built a set of new wheels, using DT spokes, Shimano Deore LX 36-hole hubs, and Mavic MA40 rims. I've also changed the crappy handlebar wrap since this picture was taken, with some white/black cork stuff. For touring, I use Madden Buzzard panniers. This has been my everyday commuting bike since July 1997. After more than 17,000 miles of heavy riding, the Nomad has performed extremely well. Features of this 1996-model: forest green color, 700c wheels, RSX drivetrain, Alivio hubs, brakes and shifters, originally it had Avocet cross tires and now has my favored Continental Top Touring tires. The most interesting thing about this bike is that I built the rear wheel, my first wheelbuilding experience. The hub of the original rear wheel became damaged, so I built a new wheel with the help of Jobst Brandt's excellent book, The Bicycle Wheel. I first built it up as an MTB-specific bike, with LX derailleurs, Alivio brakes, Ritchey rims, and knobby WTB tires. I've ridden this bike on trails all over, including the Marin Headlands, Angel Island, Alviso Slough, and Mt. Diablo. It's an adequate rigid-fork MTB; Marianne and I are more light trail "trail" riders than gnarly full-bore "single-track" mountain bikers. This off-road riding inspired the desire for a better MTB specific ride, and since the purchase of my Stumpjumper, I changed this bike into a street machine, with slick tires and a 50-tooth large front chainring. This bike now resides in San Francisco, and it's actually great for fast riding in an urban environment. This bike resides with my Mother in Maine (I'm originally from Massachusetts). During a 1996 visit I was out for a ride on my junky old Columbia Arlington 10-speed, which had been my bike during high school. I stopped into Martha's Cyclery in Plymouth, thinking that I would buy a souvenir T-shirt or something for Marianne. I saw this bike priced at $100. After a brief test ride, I bought it. (They weren't interested in trading anything for my Columbia.) This bike had been in a box for nearly 20 years, so it was like new. It's a beautiful vintage 10-speed, from the heyday of the 10-speeds. Now safely stored in Mom's garage, it's a great bike for those once-a-year visits. And yes, I still have the junky old Columbia stored there too. In August 1999 I rode this bike in an amazing hailstorm in Massachusetts. Caught several miles from my parent's house, I just continued riding through a most impressive thunderstorm - boom, flash, crack. We don't get storms like this in California. It was warm, so I didn't mind the wet so much, despite getting soaked wearing only a tank-top and shorts. The roads became flooded, I pedalled on. After about 10-minutes of absolutely torrential precipitation - we're talking buckets here - the sky cleared and a rainbow came out. "Is that the best you can do," I shouted defiantly at the sky. Probably not the smartest thing to do, but perhaps my most exciting cycling experience. Tech specs: I think it's a high tensile tubeset, components are, well, whatever. I did replace the tires with Continental Super Sport 27 inches x 1 1/4. Some people, like Mom and other friends, suggest that having more than one bicycle is excessive, perhaps even obsessive. Yes, sometimes I do indeed think I might, just might, have too many bikes. But I have my rationalizations, of course. For instance, each bike has particular attributes that work best in different circumstances. I mean, I wouldn't ride my Koga Miyata on the Bobcat Trail in the Marin Headlands, would I? Isn't a 200 kilometer brevet for Paris-Brest-Paris more enjoyable on a light road bike than on my fat-tired Stumpjumper? But I have other rationalizations. Something like: "But Mom, my brothers have each spent more money on their cars in ONE year than I've spent in my entire life on bikes." Or: "Yeah, I have several bikes. But they're more than just transportation. My bikes are also recreation and exercise equipment, aids to mental health, etc. -- cheaper than golf course fees, gym membership, or psychotherapeutic counseling." There are certainly worse things I could be doing with my time, energy and money. But I guess the best rationalization is: I like bikes, gawdammit!